Honey Bee Pollen is a potent food supplement containing enzymes, hormones, vitamins and amino acids. It is a wonderful, all natural product. Unprocessed, raw, natural, no preservatives! Pollen is the male element of the flowers and is necessary for the fertilization of the plant and continuation of the species. The honeybee is directly responsible for over 80% of all vital pollination. A. Natural Weight Control - ½ teaspoon of pollen with a glass of water, 10-15 minutes before eating stabilizes faulty metabolism often involved in unhealthy weight gain or loss. Rich in lecithin, pollen causes a speedy increase in calorie burning which helps digestion. B. 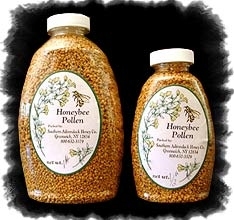 Greater Strength and Stamina - Honeybee pollen-power out-powers harmful steroids without chemical side effects. “Honeybee pollen is the greatest body-builder on Earth,” says F. Huber, German Naturalist. C. Helps to Eliminate Allergies - Bee pollen taken from bees in your part of the country, help to build up your tolerance to many allergies and sinus problems. By ingesting small amounts of pollen daily you can desensitize yourself to your allergies. Start with a few grains of pollen and build up to a teaspoon daily. If you are allergic to pollen or have a reaction, check with your doctor before taking bee pollen. Never take pollen in a pill or capsule form as they are generally produced outside of our Country. D. Increases Recovery Power - Two-year research program at Pratt Institute in New York shows that pollen improves the crucial recovery power of athletes after stressed performance…Just think what it will do for you on a daily basis. E. Skin Restorative Power - Exhaustive studies abroad show honeybee pollen can improve unhealthy skin and/or aging skin when taken internally, eliminating acne and clearing age spots. F. Complete Nutrition - Honeybee pollen gives you all essential nutrients, vitamins, minerals, enzymes and trace elements needed for good health and vitality. G. Increases Red Blood Cells - Studies show that pollen increase vital oxygen-carrying red blood cells up to 25%. You feel better when your circulation is better. H. “Long Lives Are Attained By Bee Pollen Users... it is one of the original treasure-houses of nutrition and medicine,” says Dr. Joirch of Russia. Recommended Use: Take a teaspoon of bee pollen daily. Refrigerate jar after opening. Shelf life of refrigerated pollen is one year.